Have you thought about getting starting with home canning, but not known where to even start? Growing my own vegetables is what got me started with canning and preserving. After all, I had put all that work into growing and harvesting them. The last thing I wanted to do was waste all that good food and effort. Then, another year I did some peaches. Oh my goodness. Home-canned peaches are not even in the same category as the store bought! It's summer in a bottle! Tons of work, but oh so good. Then there's home-canned applesauce. Another big step up from peaches, as far as work and mess to clean up, but again--really no comparison with the watery, sour, store bought stuff. By then I was hooked! I have done cherries, pears, and peaches almost every year, and an extra large batch of applesauce every other year or so. We've had an assortment of homemade jams that have been so delicious. I've even tried salsa a few more times, with mixed results. I have used the hot-water bath method for sealing the jars, which works for the fruits and high-acid foods like tomatoes or salsa. So far, I have not ventured into the realm of pressure canning, but I want to! For low-acid foods like vegetables, meat, or homemade soups, you have to process them with a pressure canner. Just think how awesome it would be to have several jars of your family's favorite soups all ready for those busy winter evenings. Pour them in the pan, heat them up, and dinner is done! Maybe I will get that figured out this year. Okay, so let's talk about this book already! 5 stars: My go-to reference for several years now! For the beginning canner, this book has a lot of good basic information, but it is fairly comprehensive as well. It goes through various methods of processing your canned foods, including food safety, equipment needed, altitude adjustments, and how to prepare everything. Then it has all kinds of recipes, from basic canned fruit, to jams, pickles and relishes, vegetables, low-sugar recipes, pie fillings, and even some dehydrated food like fruit leathers and beef jerky. It also has several 2-page spreads with step-by-step illustrated instructions for certain things--canning tomatoes, canning green beans, dehydrating apples, and so on. While I have branched out to other books and resources, I almost always check this one first. At least half the time, I end up using the recipe in here. I always use it when I'm canning a single type of fruit. One last tip: If you know someone who does their own canning, ask if they will come help you the first time or two. It's way easier to learn by working with someone and watching. Not that any of it is particularly difficult, but there are a lot of steps and things to keep track of. In fact, I much prefer doing it with a friend or relative even now! Make no mistake about it, canning is work--long and hot work, especially if you're doing enough to last all winter--but every time we open up a jar of fruit, I'm glad I did it. Plus, I find it so satisfying to see those gleaming rows of jars in the pantry. Have you done any canning or preserving? 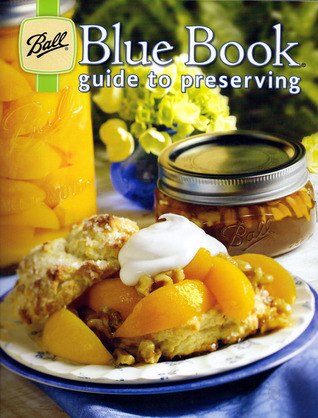 What home preserving cookbooks do you use the most?